Part of the reason for publishing my recent history of the BBC's web search service was because I had unzipped a load of old files on my PC, and discovered the original usability reports. As well as the articles on currybetdotnet, I've also made some material available elsewhere on the net. On SlideShare you can find a couple of examples of the typical sort of search related presentation I used to give within the BBC in 2003. "BBCi Search: How it works" is a presentation I gave in January 2003 for the BBCi Science team in the Interactive Factual & Learning department in White City. "BBCi Search tour" is a sample set of slides of the material I used to take around the country to present to BBC web production centres in places like Birmingham, Bristol and Cardiff. I've also made available the original set of slides from the "A day in the life of BBCi Search" presentation that I gave internally at the BBC in January 2003, which I published in text form in March 2003 on currybetdotnet as my first major blog piece about my work at the BBC. View more presentations from Martin Belam. I've assembled some sets of the screenshots I used during this series onto Flickr. 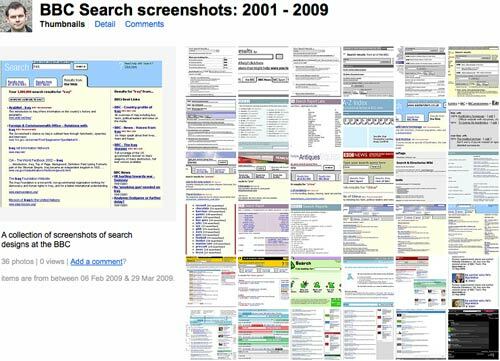 There is a collection of all of my BBC screenshots (including grabs of the evolving BBC homepage on July 7th 2005), and also a specific set looking at the search interface and behind-the-scenes systems and reports. You can also now download the entire series of posts in one PDF document. And now I promise to never, ever, ever mention it on currybetdotnet ever again.